Osmosis’s Resource Map is an index for all of our materials and a great place to see how everything is arranged. We've organized resources like Osmosis videos, Picmonics, and Sketchy Medical all in one place so you can quickly find out what's available for what you're currently studying. 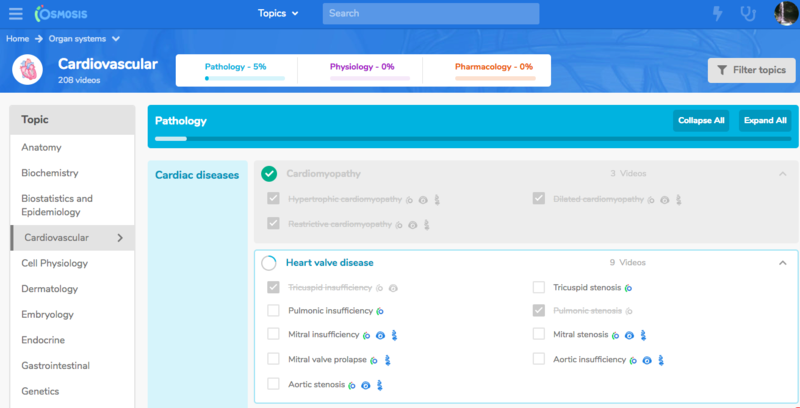 In the Resource Map, you’ll see Pathology, Physiology, and Pharmacology topics applied to Library topics. You can also select a resource filter to show or hide Osmosis videos, Sketchy Medical, or Picmonic within the mega grid. You can also check off topics to keep track of what you’ve studied.